David Williams is a native of Tucson and has been involved in volleyball for over 20 years in various capacities. David's first experience with volleyball was as the manager of the University of Arizona Women's Volleyball team. His coaching career began that same season when he started coaching club. David has worked for three club volleyball organizations: Southern Arizona Junior (now defunct), Club Cactus, and Zona. He has worked with athletes of all age levels, from U12-U18. Over the years, David has coached at Desert Christian High School, Amphi High School, Catalina High School, Townsend Middle School, Utterback Middle School, Valencia Middle School, and Alice Vail Middle School. 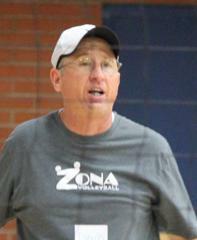 David is member of the Zona Volleyball Board of Directors and has been coaching with Zona since the 1996 club season.